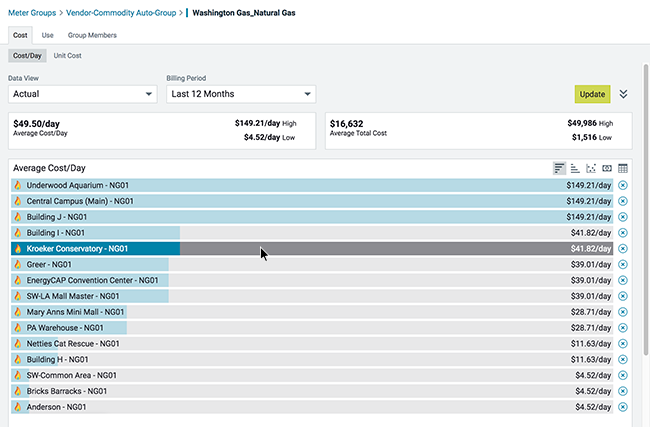 EnergyCAP’s benchmarking functionality makes it easy to rank and compare your facilities and instantly highlight outliers to prioritize energy conservation efforts, identify rate schedule issues, quantify potential savings, and much more. Peer building and meter benchmarking groups are created automatically by EnergyCAP, manually by users, and by filters using User-Defined Fields. Automatically-created benchmarking groups are based on commonly tracked traits, such as building and meter primary use, commodity, vendor, and rate schedule. Users can supplement the auto-groups by creating their own peer groups based on any user-defined condition, including, for example, building type, building location/region, construction year, control systems, etc. Group members can be compared by cost-per-area and per-day, use-per-area and per-day, peak demand, heating and cooling sensitivity, and unit cost.